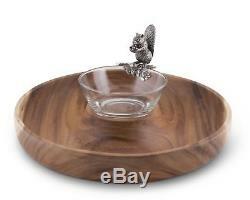 Vagabond House Woodland Creatures Cracker Serving Tray with Squirrel Dip Bowl. Resilient acacia wood, with handblown glass and solid lead free pewter; with squirrel dip bowl 15 diameter. Generously sized chips/nut bowl, made from solid and warm colored Acacia wood with a removable, handblown glass dip bowl accompanied by a stunning and adorable pewter squirrel, snacking on a nut. Serve your favorite snack from this impressive and unique chip&dip bowl - perfect for entertaining or just a nice evening in front of the TV or fireplace. Hand wash with mild dish soap, dry immediately - Do not put in the dishwasher. Use mineral oil for wood once a year. The glass bowl is dishwasher safe. Comes in a gift box - excellent for hosts, housewarmings or as a bridal shower gift. Overall Width - Side to Side: 15. Overall Depth - Front to Back: 15. Overall Height - Top to Bottom: 8. Overall Product Weight: 6 lbs. The item "Vagabond House Woodland Creatures Cracker Serving Tray with Squirrel Dip Bowl" is in sale since Wednesday, October 17, 2018. This item is in the category "Home & Garden\Kitchen, Dining & Bar\Dinnerware & Serving Dishes\Trays". The seller is "wayfair" and is located in Sierra Madre, California. This item can be shipped to United States, Canada, United Kingdom, Denmark, Romania, Slovakia, Bulgaria, Czech republic, Finland, Hungary, Latvia, Lithuania, Malta, Estonia, Australia, Greece, Portugal, Cyprus, Slovenia, Japan, China, Sweden, South Korea, Indonesia, Taiwan, South africa, Thailand, Belgium, France, Hong Kong, Ireland, Netherlands, Poland, Spain, Italy, Germany, Austria, Israel, Mexico, New Zealand, Philippines, Singapore, Switzerland, Norway, Saudi arabia, Ukraine, United arab emirates, Qatar, Kuwait, Bahrain, Croatia, Malaysia, Brazil, Chile, Colombia, Costa rica, Dominican republic, Panama, Trinidad and tobago, Guatemala, El salvador, Honduras, Jamaica, Bahamas, Viet nam.